All-new just last year, the stylish 2018 Buick LaCrosse is a traditional full-size luxury sedan with a quiet and comfortable interior, standard hybrid power and available all-wheel drive. The new LaCrosse offers a unique mix of in-cabin technology, safety features and luxurious appointments, which makes it a standout in a class that includes the Lexus ES, Toyota Avalon, Kia Cadenza and Nissan Maxima. If you're looking for a roomy, quiet and comfortable luxury sedan, the new 2018 Buick LaCrosse delivers with an award-winning interior and class-leading in-cabin infotainment technology. Tech features include onboard Wi-Fi hotspot, wireless phone charging, an easy-to-use navigation system as well as Apple CarPlay and Android Auto connectivity. If you're looking for a hybrid-powered luxury sedan in this class, you may be disappointed in the Buick's fuel economy. Both the Lexus ES300h and the Lincoln MKZ Hybrid have significantly higher miles-per-gallon ratings than the LaCrosse in the city and out on the highway. For 2018, the new Buick LaCrosse gets a standard battery pack and small electric motor to improve the fuel efficiency of its 4-cylinder engine. Buick has also created the LaCrosse Avenir, a new top trim level that features exclusive exterior trim, enhanced interior appointments, standard all-wheel drive and a list of advanced safety systems. You don't climb into the 2018 Buick LaCrosse, you enter its tranquility. Its door closes with a solid thud, sealing you off from the harsh outside world and into a silent sanctuary of leather, wood and personal entertainment. The Buick's award-winning interior is built with care and for comfort. Its large seats are supportive, heated and height-adjustable. There are pleasing shapes and uncomplicated controls. The frameless 8-inch touch screen is within easy reach and there's a tidy collection of buttons and knobs. It's spacious and the rear seat is wide enough for three with ample legroom, and the Buick's trunk is large for the class with space for multiple golf bags. The 2018 Buick LaCrosse is the luxury brand's flagship sedan, and it's one of the best-looking Buicks in the company's 115-year history. With its curvaceous lines, long, low and wide proportions and abundance of chrome trim, the LaCrosse looks like a luxury flagship. It looks important. It looks expensive. It has presence. From its simple grille with its stylish "wing" element set against a dark backdrop, to its fastback roofline and familiar portholes, the LaCrosse is detailed to perfection. HID headlights and LED taillights are standard across the line, with the biggest visual differentiator being the 18-, 19- and 20-inch wheels. Close your eyes and imagine yourself in a big Buick sedan. Soft and quiet, right? Right. But the new 2018 Buick LaCrosse is exceptionally quiet, but it's not as marshmallow-soft as you might guess if you haven't been in a Buick in the past 10 years. The Buick is traditional, but it's not old-fashioned. Instead of overstuffed seats and flaccid suspension tuning, the new LaCrosse delivers Buick-level comfort with a strong body, sophisticated suspension, and sculpted, supportive front seats. In addition to the comfortable highway ride and responsive and confidence-inspiring handling, the LaCrosse delivers plenty of power via its 310-horsepower V6 engine and smooth-shifting 8-speed automatic transmission. The new LaCrosse lineup also includes a version with big 20-inch wheels and an active suspension with Touring and Sport modes, but most LaCrosse buyers would do well to stick with the 18-inch wheel setup for superior ride comfort and no practical compromise in driving satisfaction. The 2018 Buick LaCrosse starts at around $30,500 MSRP (Manufacturer's Suggested Retail Price, including destination) and tops out at over $55,000 for a LaCrosse Avenir with all the fixin's. Although the base LaCrosse is appealing and a high value at its low starting price, moving up to the Preferred, Essence or Premium adds features as well as the more powerful engine. Also, AWD, which costs an additional $2,200, is only available on V6 models and it's a worthwhile option if you live where the white stuff falls from the sky. The bottom half of that wide range is in line with Toyota Avalon pricing, while the top half puts it in Lexus ES territory as well as other sedans from European luxury automakers like BMW, Audi and Mercedes-Benz. The LaCrosse can be an appealing alternative to any of those vehicles, but shoppers should keep in mind that Toyota, Lexus and some of the European brands have a resale-value advantage over the Buick. Check KBB.com's Fair Purchase Price to see what others in your area are paying for the LaCrosse. At its starting sticker price of $30,500, the new 2018 Buick LaCrosse comes well-equipped with standard keyless entry and push-button start, rearview camera and parking sensors, auto on/off headlights, dual-zone auto climate control, Apple CarPlay and Android Auto compatibility, built-in 4G LTE Wi-Fi, OnStar, and Leatherette seat trim. It also gets an 8-inch touch screen, Teen Driver technology, HID headlights, LED daytime-running Lights and LED taillights, Bluetooth, an 8-speaker audio system, remote start, a split fold-down rear seat, power front seats with adjustable lumbar, a tilt-and-telescopic steering wheel, heated outside mirrors, 18-inch wheels and tires and front-wheel drive. Some of the appealing extras on the long options sheet for the new Buick LaCrosse include heated/ventilated/massaging front seats, perforated leather upholstery, a sunroof, navigation, wireless phone charging, a heated steering wheel, a power rear sunshade, auto-dimming-outside mirrors and a head-up display. Also on offer is a long list of driver-assistance and safety technologies, like blind-spot monitoring, rear cross-traffic alert, lane-keep assist, adaptive cruise control, automatic park assist, front pedestrian detection and automatic braking. All-wheel drive is also available, as are larger 19- and 20-inch wheels and a 310-horsepower 3.6-liter V6 engine backed by a smooth-shifting 8-speed automatic transmission. Parents of new drivers will appreciate this important safety system, which is standard on every 2018 LaCrosse. It sends you updates and alerts about your teen's habits behind the wheel, allows you to set a speed alert and a max volume limit on the LaCrosse's audio system. It can even disable the Buick's sound system until the front-seat occupants buckle their seatbelts. Standard on the 2018 Buick LaCrosse Premium, this unique safety system alerts the driver of hazards by vibrating the driver's-seat bottom cushion. And the warnings are directional; it vibrates the right-seat bottom bolster if the threat is coming from the right or the left bolster if the driver should look left. For 2018, the new Buick LaCrosse is powered by a 2.5-liter 4-cylinder engine in combination with a small electric motor and battery pack. The powertrain delivers 194 horsepower and 35 mpg on the highway. It's paired with a 6-speed automatic transmission. However, most trim levels get a sophisticated new 310-horsepower 3.6-liter V6 engine with direct injection, cylinder deactivation, and auto stop/start technologies. Combined with a new 8-speed automatic transmission the Buick's V6 delivers strong acceleration, and it's available with front- or all-wheel drive (FWD, AWD). The 4-cylinder is FWD only. All-new just last year, the stylish 2018 Buick LaCrosse is a traditional full-size luxury sedan with a quiet and comfortable interior, standard hybrid power and available all-wheel drive. The new LaCrosse offers a unique mix of in-cabin technology, including onboard Wi-Fi, safety features and luxurious appointments, which makes it a standout in a class that includes the Lexus ES, Toyota Avalon, Kia Cadenza and Nissan Maxima. Buick offers the 2018 LaCrosse, which is its largest and most expensive sedan, in five trim levels: base, Preferred, Essence, Premium and the new top-of-the-line Avenir. Prices start around $30,500 for the base model, which is front-wheel drive and powered by a 2.5-liter 4-cylinder engine in combination with a small electric motor and battery pack. The powertrain delivers 194 horsepower and 35 mpg on the highway. Other models get a 310-horsepower 3.6-liter V6 with standard front- or optional all-wheel drive. 2018 Buick LaCrosse Avenir – Should Lexus Be Worried? 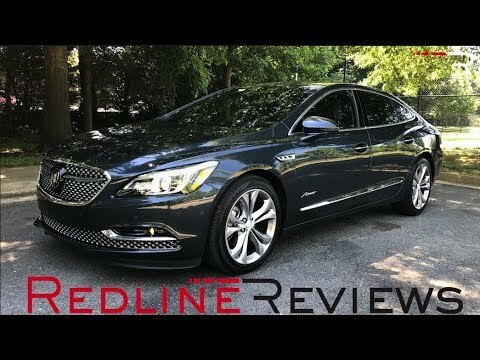 2018 BUICK LACROSSE REVIEW - How Good is Buick&#39;s Luxury Sedan? That it drives well and fits a car seat nicely. While I really like my new vehicle, and am very loyal to Buick, new cars these days are almost too automated. Lots of touch screens, hard to locate controls. I know I can figure it all out it is just sometimes frustrating when something that should be so simple is impossible to find. It turn heads when riding down the street. I love my 2018 lacrosse, it rides smooth, it drives nice, it make you feel luxurious, it is a recall on it something about the back brakes but it is still fabulous, my vehicle talks back to me when I talk to it, I love the OnStar any problem is just a button away for the answers. My vehicle is spacious and gets good gas mileage. We chose this model because it fit a car seat well and had the rear sunshade for our infant. I dislike how automated the car is. Too many touchscreens.